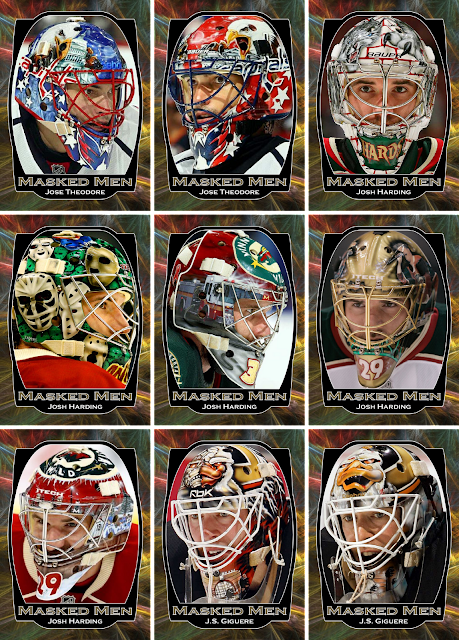 I've done plenty of work the last few weeks on my Masked Men project and have decided to stop the project at 198 different cards. This is mainly because its becoming more and more difficult to find high quality images for all of the masks I'm looking for. The 198 is simply because it works out evenly to 22 nine-card pages. 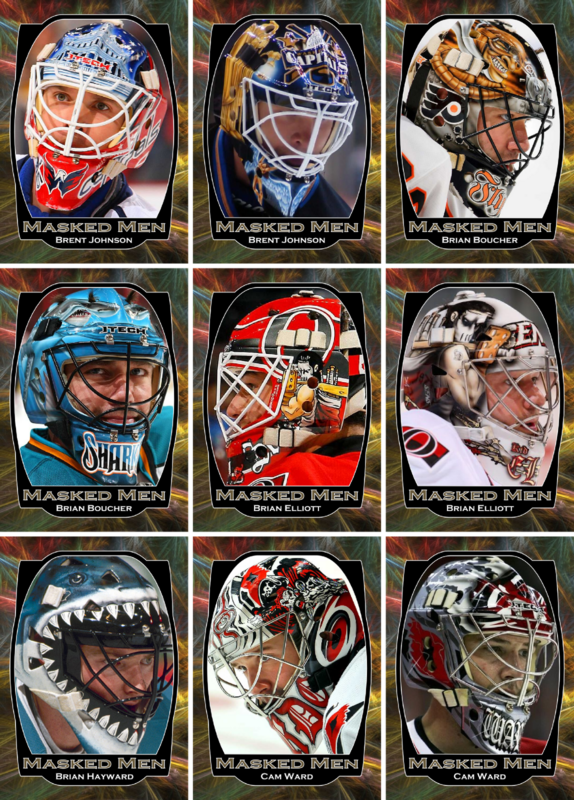 There is definitely no denying that goalie masks are the most artistic pieces of sports equipment. 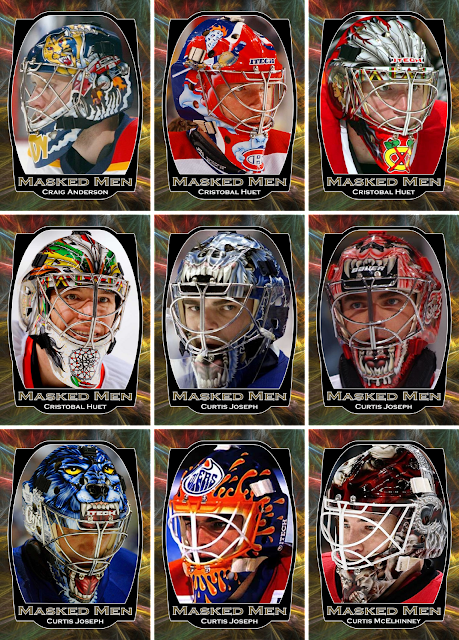 Just look at the range of designs seen in these 99 different masks. Its so hard to pick a single favorite from this first set so I will come up with my top three. My number three would have to be Brian Elliott's newest mask featuring Casey Jones from Teenage Mutant Ninja Turtles. 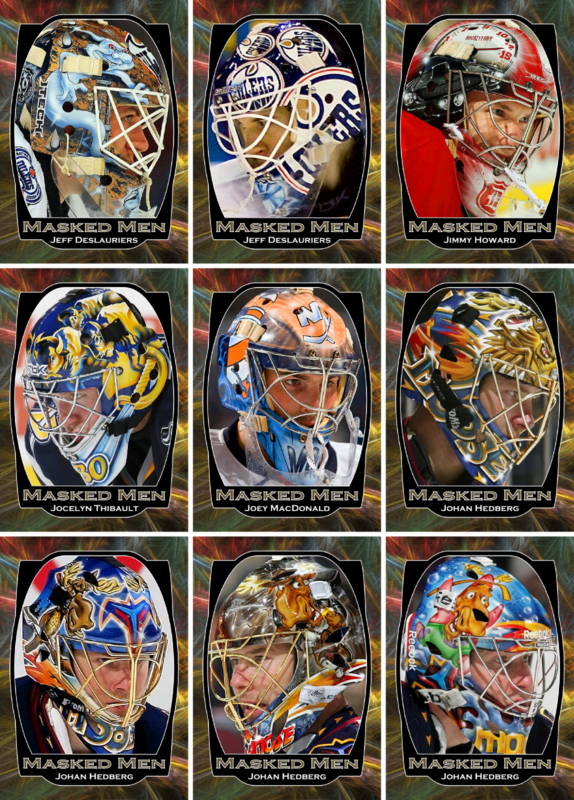 My number two choice would have to be Jimmy Howard. How can you go wrong with the old school D on the chin and the speedometers on the sides? My number one would have to be Curtis McElhinney's second entry in this list. There is just something awesome about flames and a cowboy hat wearing skull pointing a gun at you. This pick goes way back to 1995-96. It's a Stoppers Sean Burke from the Score set that year. Gotta love seeing the whale once again, one of the cooler logos in recent history. One of the things I like about this card is it reminds me of back when I was a kid and collecting cards because it was just fun. It's definitely an interesting design. I can't think of many cards that make use of a brick wall and graffiti. The font on "Stoppers" is just perfect, same goes for the player name. I also like the large team logo right on the center of the brick wall background. The one weird thing about the card is the blank space to the right of the player image. I just finished my last final exam for the term this morning and thought it would be a good idea to reward myself with some new hockey cards. I went to one of my local card shops, Extra Innings in Mason, MI, and looked for something I could afford with the change in my pocket and ended up with a pack of 2006-07 O-Pee-Chee. This pack came with six cards and even thought it was a hobby pack, I did not expect to pull anything spectacular. After opening it I was the proud owner of six non-spectacular new base cards, the best of which is listed in the rundown below. Not too bad for only paying $1 the six card pack. It's not the greatest set in the world, but hey what's wrong with cheap hockey cards. 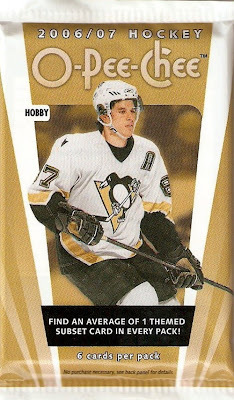 Check out MY HOCKEY CARD OBSESSION for an excellent review of this particular set. This pick is a 2002-03 Pacific Game Jersey Martin Erat. The reason I chose this as one of my picks is the jersey swatch used in this card. 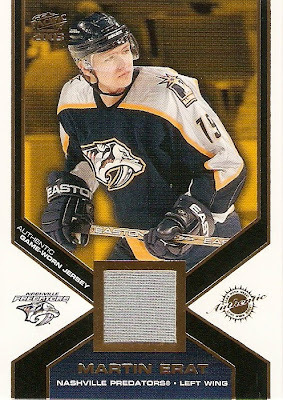 Nashville is one of the very few teams to use the silver metallic jersey material in the NHL and I thought it was cool to pull a jersey card with this particular type of swatch in it. Aside from the silver swatch, this particular set is actually a pretty sharp looking one at that. I like how all four corners of the card converge right to the centered swatch. The white background works well with this design, especially with the black lines and gold foil trim. Another nice touch was the team colors filling in the background of the areas above and below the swatch. The Pacific logo is small and nicely placed in the upper left hand corner, although just barely missing Erat's head. The standard "authentic" logo and team logos are also nicely placed on either side of the swatch against the white background. While I was picking up another USB keyboard for my laptop last night, the third one now, I noticed all of the trading cards were marked 20% off. I couldn't resist and grabbed one pack of 2009-10 UD Series 1. That turned out to be a good idea, here is the rundown. 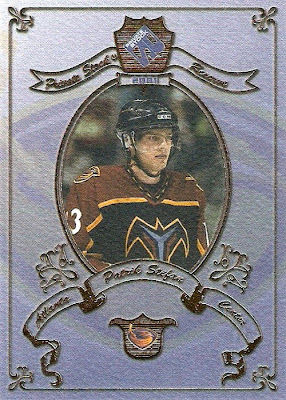 Continuing the trend of players wearing the number 13 in this series, this Patrik Stefan card comes from Pacific's 2000-01 Private Stock Reserve insert set. This card is somewhat unique because it's printed on a very thin paper like card stock, so it's fairly flexible, and because the back is entirely blank aside from the manufacturer information and card number. Although it does not scan all that well, the intricacy of the gold foil on the front of the card makes its that much more appealing. All of the text and borders are done in the same gold foil as well making for a nice overall look. The smaller player image works well for this design, especially with the faint team logo in the background of the design. Also, the Private Stock and smaller Thrashers logos are perfectly sized and do not distract from the overall design. 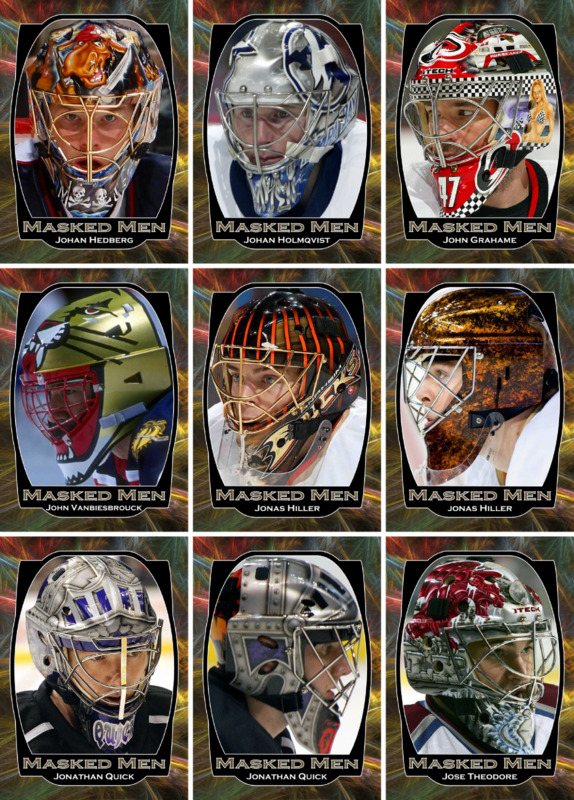 I was doing some searching for masks for the Masked Men set I'm working on and came across some really neat information about goaltenders and their masks. 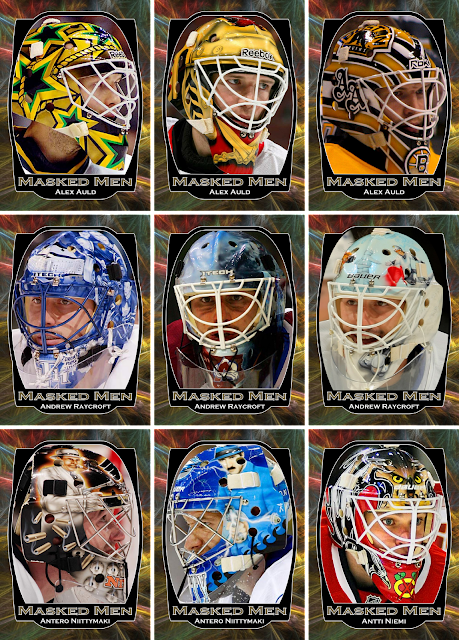 There are two .pdf files, one for the eastern conference and one for the western conference, that show goalie masks from each team along with a description. 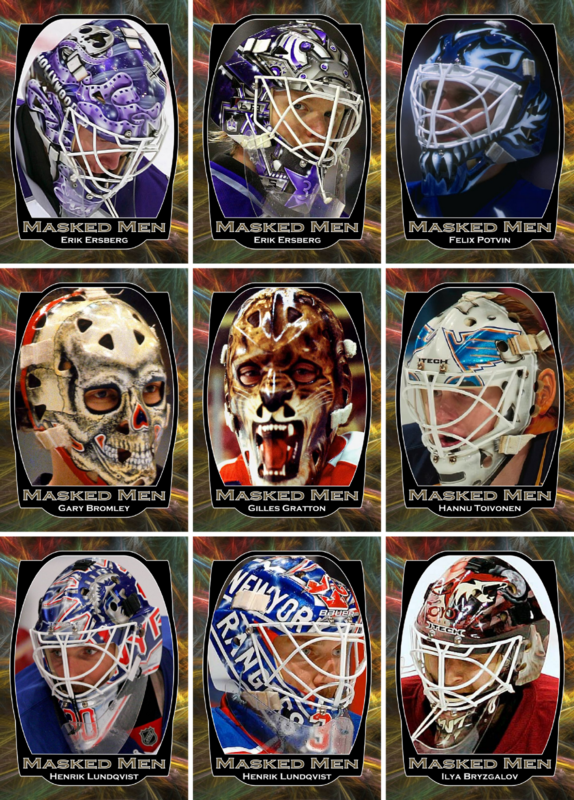 It's a great read if you're interested in the stories behind these particular masks. 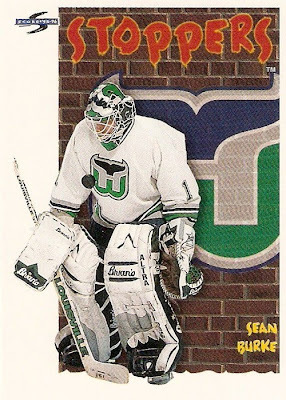 This pick comes from the 1999-00 Upper Deck Ice Gallery insert set. 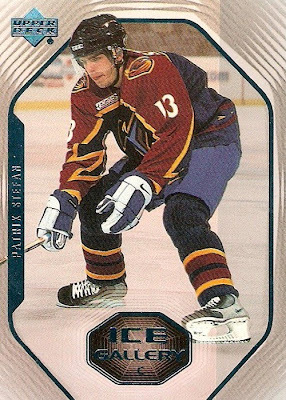 It's kind of fitting that Patrik Stefan, who wore number 13 for the Thrashers back in the day, is pick number 13 in this series. Stefan was the first overall pick for Atlanta in the 1999 entry draft, which made any of his cards a must have at the time. For some reason, I decided to go along with the hype and began collecting Stefan cards left and right, and this one has to be one of my favorites. I have to say this was one of the sharper looking insert sets from any base Upper Deck set of the early 2000's. The elongated octagonal window for the player image is interesting, better than going with a simple rectangle with rounded corners or something. The pattern around the border of the card adds a great effect to a rather simple and uncrowded design. The player name is nicely placed vertically on the left side out of the way, which gives the card a slightly asymmetric look. The Upper Deck logo is nicely placed in the upper left corner, where it doesn't really take away from the overall look of the card. The Ice Gallery text is pretty sharp, especially with the spiderweb design surrounding it. I've been debating what I should begin storing several of my collections in from this point forward, mainly the Super Script, Gold Script sets and any future TTM autographs. In the past I have gone with the 9-pocket pages for all of my cards except for the special ones (i.e. jersey cards and autographs) to differentiate them from the commons. Now I've begun to wonder if there is really a difference in long term effects between the top loader / penny sleeve combination and the 9-pocket pages. I think it would make more sense, economically and spatially, to go with the pages for the Gold and Super Script sets and the TTM autographs, mainly because they are standard card stock, although I have them in top loaders right now because I have so few of them. This should slowly begin to change here soon when I fully get back into the hobby after college. I think I am leaning towards the pages for the autos, simply because I can neatly keep them all in one binder. Same goes for the Gold and Super Script sets. Has anyone noticed any major differences between the two storage methods? I've been making quite a bit more progress on the Masked Men custom set and wanted to preview the set with the first page. I've gone with the 9-card page setup because it makes the most sense, and it worked for the OPC customs from a few weeks ago. 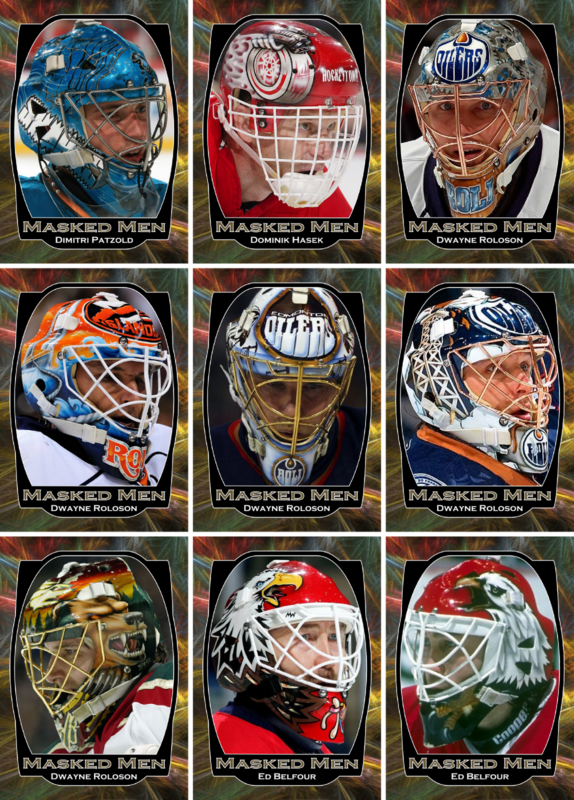 One of the cool things about this project is seeing how a particular goaltender's mask design changes over time and from team to team. There are so many different masks out there, and the hardest part is finding decent quality images for each of them. As you can see, this page is in alphabetical order, which will be the case when the entire set is finished. I'm going to sort it this way because I'm more interested in the individual goaltenders than the teams they play for. There's a long way to go with this project, but I think it will be worth it in the end. As of today, I have 150 custom cards completed. I'm guessing the final count will end up somewhere between 200-300, but only time will tell. This pick is a 2001-02 BAP Memorabilia Ruby Pavel Datsyuk. Technically this would be considered a RC, but I'm not exactly sure what the expo stamp does to the value. I picked it up at a local card show a few years back for only a couple bucks, not bad if you ask me. 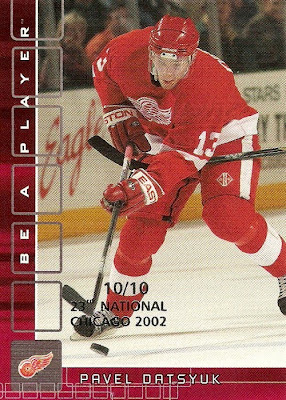 One of the things I like about this card, besides the fact that it is Pavel Datsyuk, is the 10/10 stamp. Even though the stamp is not an official serial number from the manufacturer, it's the lowest numbered card in my collection. The basic design of the card is pretty sharp in my mind. The only part of it that doesn't work very well would be the vertical squares on the left side. It's doesn't line up very well with the spacing of the Be a Player text. The action image works for the card, although it may have been better if they found an image without an opposing players stick. Also, the stamp would have been better placed somewhere in the white space rather than directly over the darker colored skate. 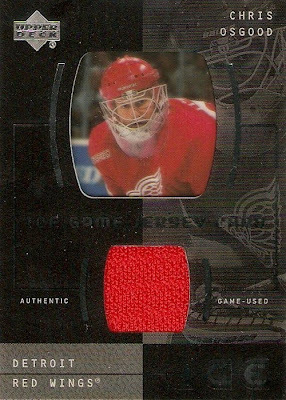 This pick is a 2000-01 Upper Deck Ice Game Jersey Chris Osgood. First off, the fact that these are acetate cards makes this set that much cooler. There is just something about cards that you can see through and this one is no different. The most interesting thing about this card is being able to see the jersey swatch through the back of the card and how it is cut and placed in the card. It's interesting because it's something you don't see all that often with memorabilia cards. Overall, it's a pretty solid design. I like how it's kind of divided into the four quadrants and how the shape of the window for the player image and the jersey swatch are the same. The repeated image on the right side adds a cool effect as does the interconnected silver foil surrounding the two windows. The text is readable and not overbearing. The UD and ICE logos are nicely placed in opposite corners and do not take away from the overall design. The swatch size is appropriate but could have been a little bigger. The only downside to this card is that it did not want to scan very well. There's something about silver and gold foil that my scanned does not like. After reading about TTM (Through the Mail) over at Moody's TTM Blog, it reminded me that I have about 20 past successes sitting in top-loaders that I would like to share. I started doing this sometime during middle school and sent cards primarily to the Wings in hopes of receiving autographs. I was fairly successful, even with some of the big names. This has also got me thinking about sending out some cards for the first time since then, especially with all of the duplicates I've been accumulating from recent pack breaks. I've got at least 1000 relatively new duplicates (2000 or newer) sitting in boxes at home. These may be good candidates for some TTM trials, and I won't run the risk of loosing cards. Previously I mentioned that I am working on several customs card designs and now I'm ready to preview two of them. The reason I bring them both up in one post is that they go hand in hand with one another as you will see below. 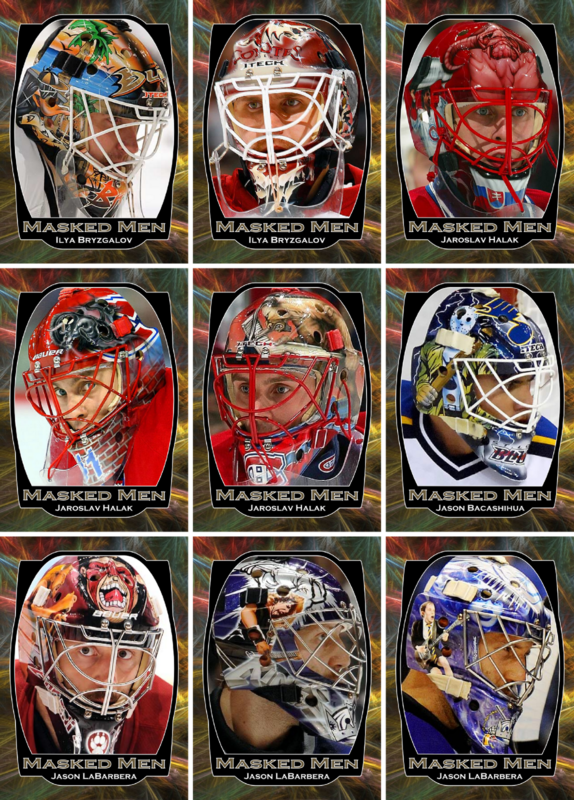 The first set I'm calling Masked Men, which will highlight the many different mask designs of past and present goaltenders. 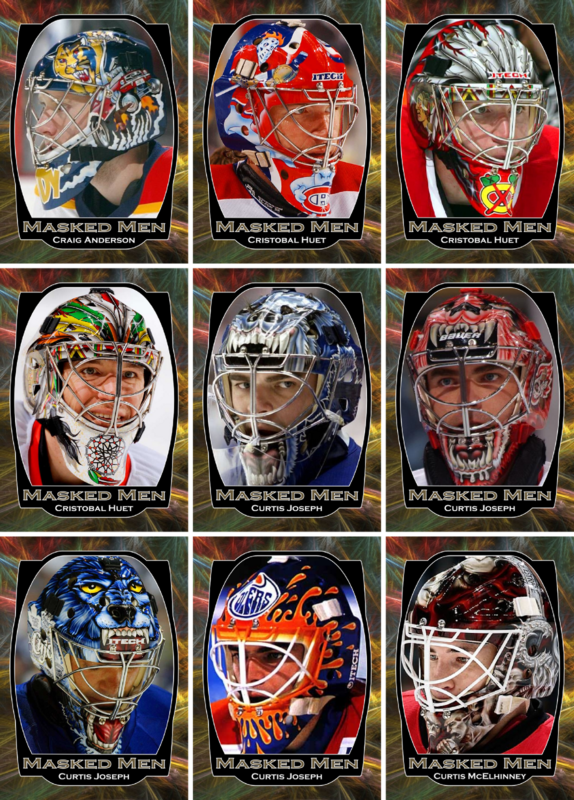 I chose to preview this set with one of several Kari Lehtonen cards because a mask featuring Optimus Prime has to be one of my favorites. 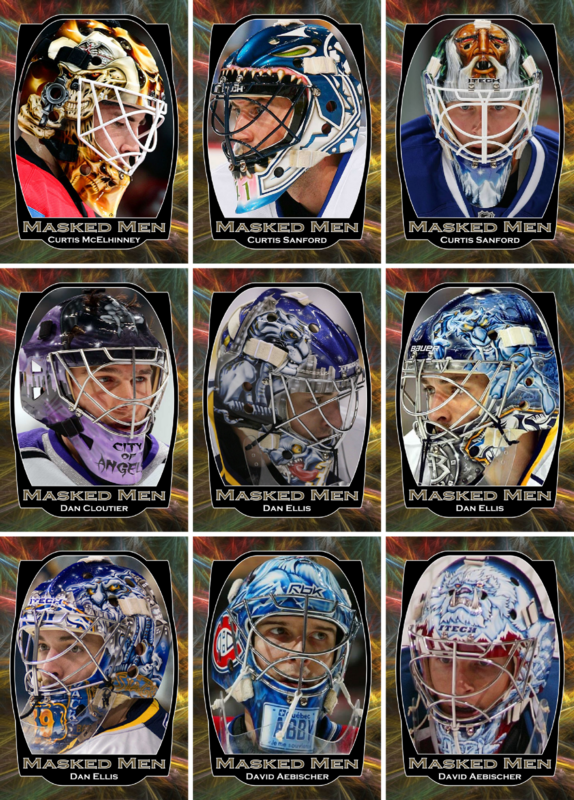 The second set is titled Masked Materials, which will feature game used memorabilia from some of today's best goaltenders while showcasing their masks at the same time. 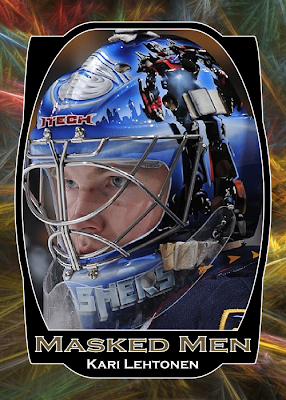 The design is slight different than the Masked Men design, but borrows several key features, namely the border and font. I just came up with this design today and have only completed two of them so far. 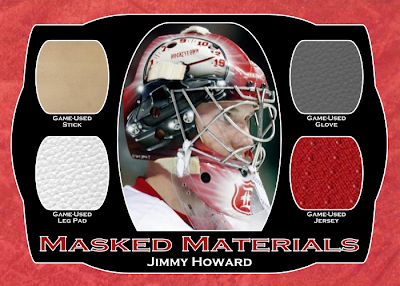 I've decided to preview this set with Jimmy Howard. I have plenty of work to do with both of these sets, but I will post both in their entirety when finished. 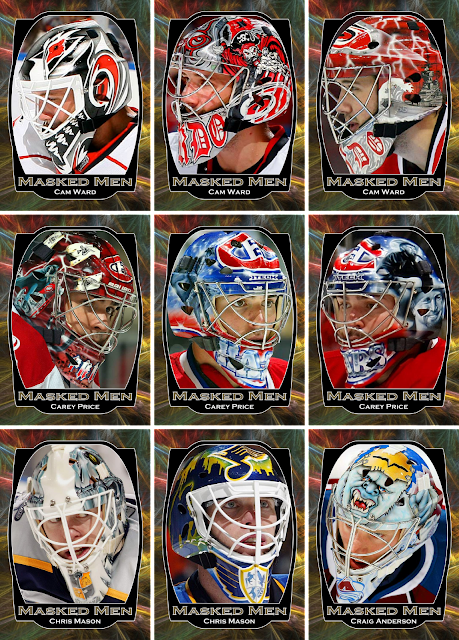 Currently, I'm up to 112 different cards for the Masked Men set, and there's plenty of masks left to create cards for. I've been playing with a few custom card designs of my own lately and wanted to share one of them. The idea came to me for this set when searching for a new desktop background when I came across the image I used for the background. As of right now, I have two of these completed: Brodeur and Gustavsson. 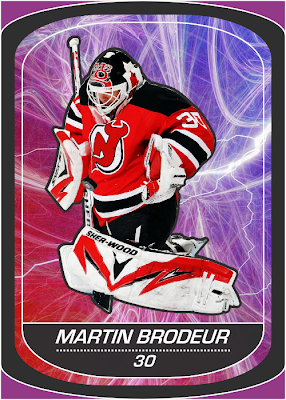 I plan on using the same set of goaltenders from the 84-85 OPC set I created a few weeks ago. Its a bit more tedious to finish one of these because of the complex cropping I need to do within Inkscape before adding the border around the player image. This pick comes from the 2003-04 BAP Memorabilia Deep in the Crease set. 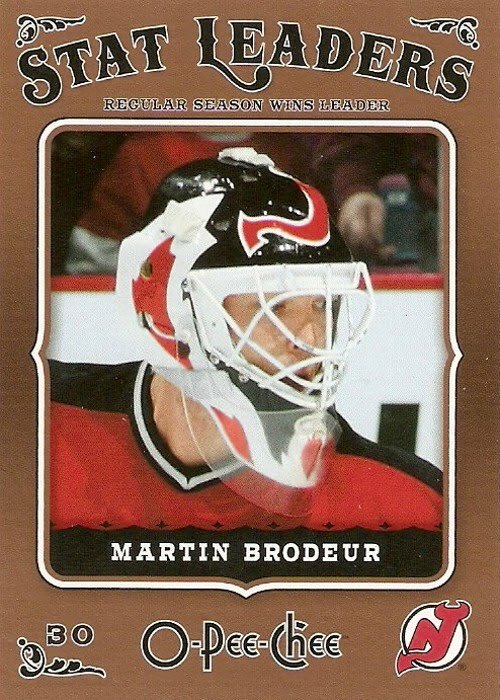 It features both the current goaltenders and future goaltenders for the Red Wings. 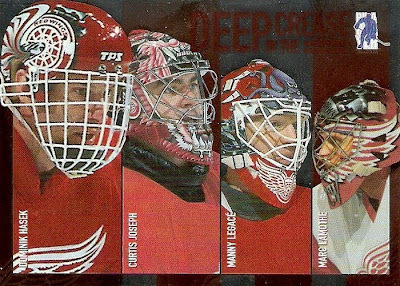 This one features: Dominik Hasek, Curtis Joseph, Manny Legace and Marc Lamothe. Not a bad group if you ask me. As far as the masks go, I would have to say Joseph's is the best, followed by Hasek and Lamothe, and finally Legace. 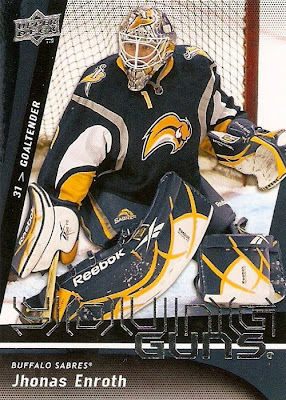 Anyway, the idea behind this set is unique in having so many goaltenders featured on the same card. It has a nice headshot of each of them, emphasizing them from left to right. The names are nicely placed vertically, not taking away too much from the images. There is no team logo on this one, only the BAP logo in the top right corner, which also is not too overbearing. 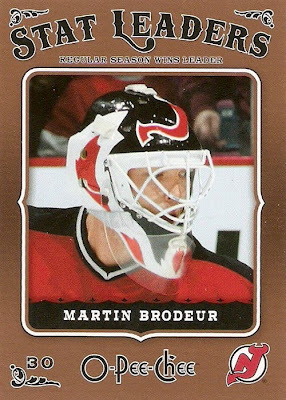 The "Deep in the Crease" text is nicely placed at the top, but would have worked a little better in another color besides red, with the red background and all. I thought it was time to change the template for Card Boarded, I simply got bored with the old one. This new one in my opinion make the blog a bit easier on the eyes. I also decided to update the title image to match the new template.